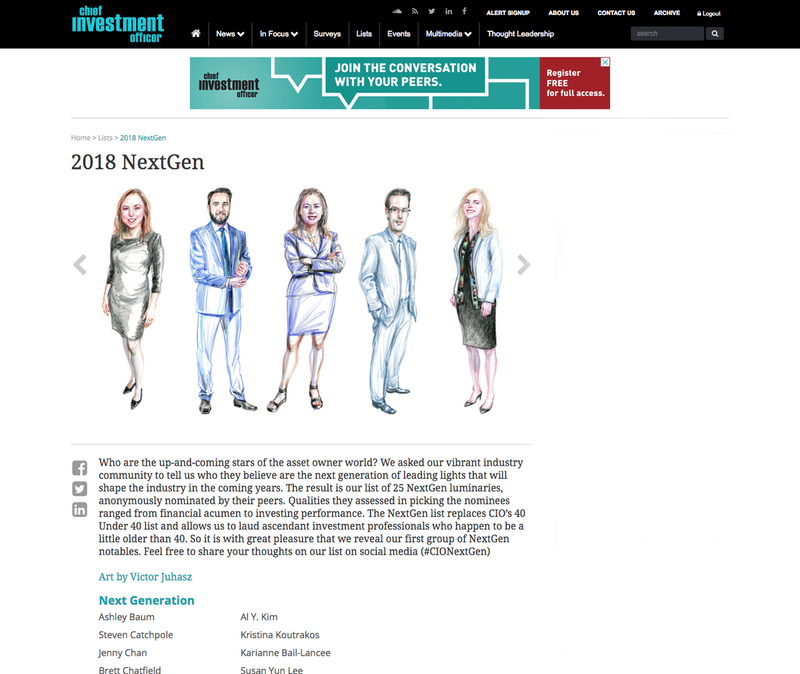 I was particularly pleased to hear from Art Director extraordinaire, SooJin Buzelli, a couple months ago, when she inquired as to my availability to do some portraits for this year’s online issue of Strategic Insight of 25 “Next Generation” people in the investment community. 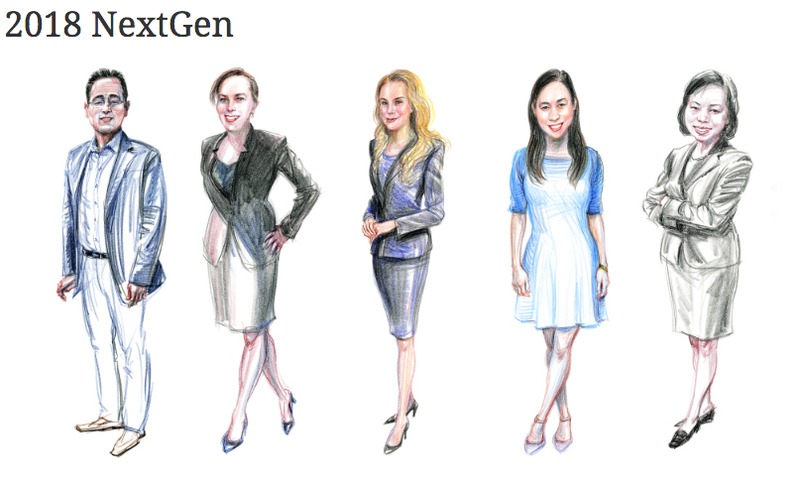 My work over the past few years has drifted from outright caricatures to something I think of as stylized portraits and this looked like another opportunity to either play in that realm or just go serious and straight ahead. My initial sketches from the reference provided leaned more toward that big head little body approach to caricature/portrait but SooJin wanted me to play it as more straight ahead drawing. Which was fine by me as drawing is what I like to do best, especially when there’s enough of the discovery process still showing in the finished image. I had been warned about possible less that great quality photo reference that the subjects would be providing. It’s a curiously funny condition. People having their portraits done often demonstrate a certain unmindfulness about their image and consequently forward the least informative photo reference. But that was not the case this time and I would have to thank SooJin and her production manager, Lynn Connelly, for impressing the importance of detailed head and body shots, and to a person they delivered. This made my end of the work much easier. There was also the understanding that these people are not politicians or media celebs so a lighter touch was to be employed and there would be no editorializing their looks. As with all drawing, I connected spot on with some of the subjects on the first or second try and it felt like the most natural process in the world; others went through numerous re-dos and re-thinks which felt like steep climbs. In those situations, doubt and second guessing are the big enemies. At least 60% of the time I found myself returning to the original, even if flawed, attempt where the first impressions proved to be the most incisive and build from there. Sometimes all it takes is to review the intuitive response of the first attempt, set it aside and proceed. The consensus was not to go for the overworked, over rendered finish. SooJin wanted to see the drawing first and foremost. Overall, the results were very satisfactory and the support was gratifying from SooJin and Lynn. If another attempt was requested, the reasons were solid. I am grateful to have enjoyed the opportunity to do this assignment. SooJin is one of those rare art directors who trusts the people she hires. Initial thoughts on how to approach this. While the drawing expressed character, the pose and clothing didn't quite work. New reference needed.